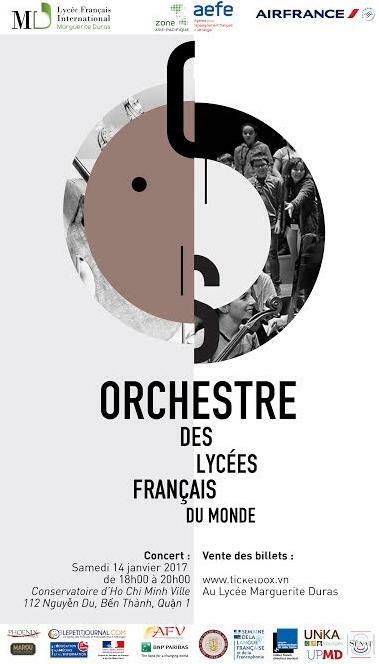 The Orchestra of the French High Schools of the World is a musical project whose aim is to create an interaction between pupils musicians from different schools of the world which are part of the network of the AEFE as well as the pupils chorus-singers of the French International High School Marguerite Duras of Ho Chi Minh (Vietnam) and Marcoussis’ (Paris and the surrounding area) who share two passions, French and music. The concert will be under the direction of Adriana Tanus (Professor of Music Madrid), Claire Perez-Maestro (Music teacher in Marcoussis) and Magali Chaudemanche (Music Teacher in Ho Chi Minh city). The musical repertoire, mainly French, will bring together 60 musicians and 60 singers from 5 continents of the world corresponding to thirty different countries. The concert is organized by the French International School Marguerite Duras under cover of the AEFE (Agency for French Education Abroad).